One more day down, one more chunk taken off our "To Do" list. Today was spent checking out of housing, returning our borrowed kitchen kit to the loan locker, and finalizing the schedule of events for my retirement ceremony. Our housing manager had to keep checking her paperwork to convince herself that we'd actually been living there four years. She was hard-pressed to find any discrepancies and we passed our final inspection with flying colors. She even thanked us for taking such good care of the unit while we were there. In my last Travelogue entry I mentioned that our trip plans have drastically changed recently. Today those plans were finalized when I received a phone call from the US Forest Service. We (Tamara and I) have been selected as "Wilderness Information Specialists" and Trailhead/Campground hosts for a trailhead and campground on the edge of the wilderness in Wyoming. We are to report for initial training on 16 June. For me it's a chance to get back to my roots. Mountain living, fly fishing, lots of trees and very few people. For Tamara it is a chance to get her foot in the door for a permanent position with the Forest Service. A few years ago she worked the summer as a volunteer for the Parks Service at Jewel Cave in South Dakota. At the end of her tour she was offered a full-time paid position for the rest of the season but she turned it down so she could return home to me on Guam. For both of us it's a chance to kick back and relax for a while after our bike trip. 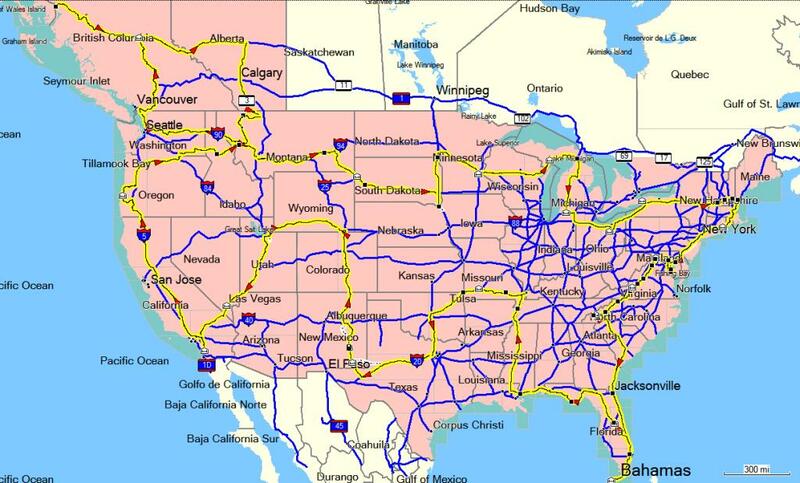 We still plan on making the 49-state tour (latest version of the route posted at http://imagesdesavions.com/biketrip/overall.jpg) except that now we will need to leave as early as possible and go clock-wise and MIGHT not be able to complete the run up to Edmonton and back. By the time we get to Alaska at the end of May we will have hit every other state with the exception of Idaho. If the weather warms up enough, soon enough, we'll be able to pick up Idaho on the way east. If not we'll likely have to haul the bike out of the mountains in a U-Haul truck to where the weather is more 'safe' and pick up Idaho after we leave Alaska. We've already ordered electric vests and chaps to wear under our riding gear so we're ready for cold. It's icy roads that worry us. I've ridden on ice and snow solo but just ain't gonna do it with Tamara on the back. This, of course, means we will need to shorten our expected layovers. Most places we stop will be a one-night only rest stop. We have several day-long stops planned throughout the trip but after figuring how long it will take for "on-the-road" days and needing to be in Alaska on 25 May, it left us with only 15 days of "down time" for extended lay-overs. We each have a couple "gotta do's" (me, Air Zoo in Kalamazoo and Tamara, Epcot Center in Orlando, for example) that will require an additional day but for the most part we've each made a couple compromises and so long as everything goes okay we'll make it to Alaska right on time. ...but things don't always "go okay". In case of some-kine mechanical breakdown we've signed up for KOA's "RV RoadHelp" program. This roadside assistance program is about the best we've been able to find. Among other things, it covers any "RV" (including motorcycles) that we own and includes unlimited towing to the nearest service shop capable of making the repairs. In case the worst happens and we find ourselves unable to continue on, we've got that covered with membership in MedjetAssist which will take care of us in case we have a crash and are injured. Both of these programs were recommended by my fellow insaniacs on the Long Distance Rider's mailing list. Hopefully we will get to the end of our trip and say, "What a waste of money that was!" Tomorrow will be occupied with our final checkout from PSD (hopefully all will go well there) and a rehearsal for my retirement ceremony. The next day we pick up my Dad and step-mother from the airport and do it for "realsies". Time is closing fast. I hope I'm ready for this.